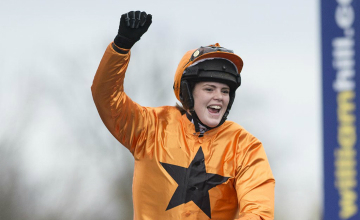 Lizzie Kelly, the focus of much media attention in the run-up to becoming only the second woman to ride in the Cheltenham Gold Cup last month, did not feature in many post-race headlines after her mount Tea For Two unseated her at the second, but the pair will have another shot at the spotlight in the Betway Bowl on the opening day of Aintree's Grand National meeting on Thursday. Trained by Kelly's stepfather Nick Williams and part-owned by her mother Jane, Tea For Two faces six rivals in the £150,000 Grade 1 headed by Gold Cup faller Cue Card, who won the race 12 months ago, and Silviniaco Conti, successful in 2014 and 2015. Kelly, who became the first female jockey to land a Grade 1 race over obstacles in Britain or Ireland when partnering the eight-year-old to victory in last season's Feltham Novices' Chase, spoke frankly on Tuesday about her early Cheltenham exit - something she hopes will not leave its mark on her mount. "It was hugely disappointing as we never got the chance to run our race," she said. "You're disappointed if you fall at that point in any race let alone the Gold Cup. "Everyone's got the horse ready for the day, but you don't get the chance to see how you get on, so from that point of view it was hugely frustrating. Personally it was just disappointing I didn't get the opportunity to go through with everything I'd planned. "I thought I handled the situation well and was just looking forward to riding him, only for it to be cut short. 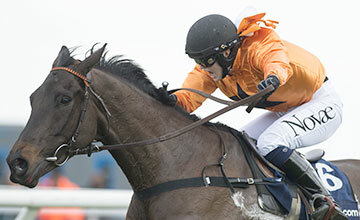 But at least he didn't fall at the second-last - that would've been a lot worse because he's not actually had a race." Providing an insight into how Team Williams have handled Tea For Two since Cheltenham, and the challenges they have faced, Kelly added: "Say the meeting was abandoned, the horse wouldn't actually know there's been a race, but it's hard with a horse like him who gets quite nervous off the buzz of a racecourse. "It's difficult because he'd had all the nervous energy without being able to use it. It's a case of trying to keep the lid on him. We've done a few bits and pieces and I've ridden him and am happy enough. "For a while it probably knocked his confidence, but we've done a few pieces of work to let him win and build his confidence again because it was his first-ever mistake on a racetrack. It's one of those things and it's unfortunate it had to happen in the Gold Cup, but he'll learn from it. "When something like that happens it's not a case of babysitting him, but I want him to get his first few jumps right and get confident. They're the issues at the moment - and once we've done a lap then we can start to think about winning!" Nicky Henderson will certainly be thinking about winners after declaring Champion Hurdle hero Buveur D'Air for the Betway Aintree Hurdle on Thursday's card, but the three-time champion trainer, who is odds-on for a fourth crown, has resisted the temptation to enter Racing Post Arkle winner Altior in the Doom Bar Maghull Novices' Chase on Saturday. That race was reopened until Tuesday morning and Henderson's title rival Paul Nicholls has engaged Marracudja, Politologue and Sunday's Ascot winner San Benedeto.